This photo is from an incident that occurred in my city today. 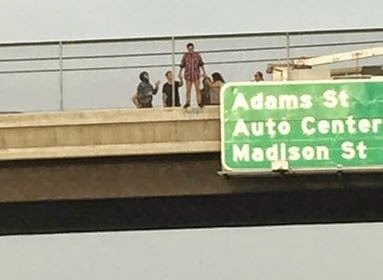 This young man was going to jump from an overpass in a suicide attempt. Concerned citizens came together and talked him out of his decision and hopefully he is now getting the help he needs. Why am I talking about this tonight? Because first of all it didn't have to come to this for this young man. If you feel this hopeless, please reach out to someone. If you feel like you can't reach out to someone close to you please call a help line or call 911. There is no shame is asking for help. Secondly, this is an amazing example of the power you hold. These people had no obligation to stop for this hurting man. They did so out of the goodness of their hearts. Out of compassion and caring. And in doing so they saved a life. If you think someone is standing on the edge please reach out to them. You never know if you may be saving a life. This is our whole focus this Movember. Please spread the word. Help us break the stigma that having a Mental Illness holds as well as the stigma that asking for help carries. And if you can, please support my husbands Movember Fundraising, or simply pass along his efforts and message. There is a giveaway for all donors.